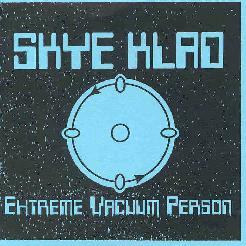 Skye Klad - "Extreme Vacuum Person"
On this 5-song (30 minute) CD, Minnesota's Skye Klad plays a dreamy, ethereal form of spacerock that is backed by complex instrumentation, and some wonderfully freaky guitar sounds. The band consists of Adam Backstrom on vocals, Jason Kesselring on guitars, synths, and theremin, Matt Zaun on percussion and samples, and Tim Donahue on bass (the promo material and web page say Dave Onnen is now the bassist). The disc opens with "The Somnium". Musically this reminded me a bit of Architectural Metaphor, though even more psychedelic. The promo material compares the band to Can and after revisiting some early Can recordings I can say this is fairly accurate. A banquet of guitar sounds and effects produce a subtle intensity that reveals something new with subsequent listens. "Journey To Inner Space" combines simple, but psychedelically eerie guitar notes with wildly busy electronic percussion and a pounding bass. "Song II" is more of the same with Backstrom's simultaneously dreamy and harsh vocals. The band begins to stray into King Crimson influenced territory on "The Amplification Of Stephen Hawking's Brain". A repeating robotic voice says 'Dark mystery of time and space' throughout the song backed by tribal percussion, guitar attacks, and low-end bass. The pace soon picks up and then veers into a still very spacey, but 80's-era funky Crimson jam. The Crimson influence is even stronger on "The Theory Of Creating Artificial Lifeforms". More like a mid-70's Crimson jam, the tension builds slowly as percussion, bass, and guitar jam away distinctly from one another. Kesselring's guitar is Frippoid but far more acidic. I want to emphasize that despite the obvious Crimson influences these guys manage to stay well within the realm of spacerock. This music begs to be heard live and I'll bet the band thrives when able to stretch out on stage. In summary, I find Skye Klad's use of complex instrumentation and Crimson-like jamming style within a spacerock context refreshing. Hopefully the band is working on a full-length follow up to this short introduction to their music. You can visit Skye Klad at their web site.